Since 2008, the Department of Computer Science and Engineering has been continuously making progress in teaching and R&D activities. Started with an intake of 60 students, it offers quality higher education to numerous worthy young fellows as well as to meet the huge demand of highly qualified specialists in the field. The department has a good number of full-time faculty members with best available exposure to ever-growing horizon of Computer Science and Engineering. As far as the Department is concerned, academic standards and placements are the two key parameters. Our academic standards have been achieved by the intellectual property of our faculty. The faculty strives to foster and encourage a teaching methodology that is both practical and theoretical in approach. This orientation has led to successful training and placements. 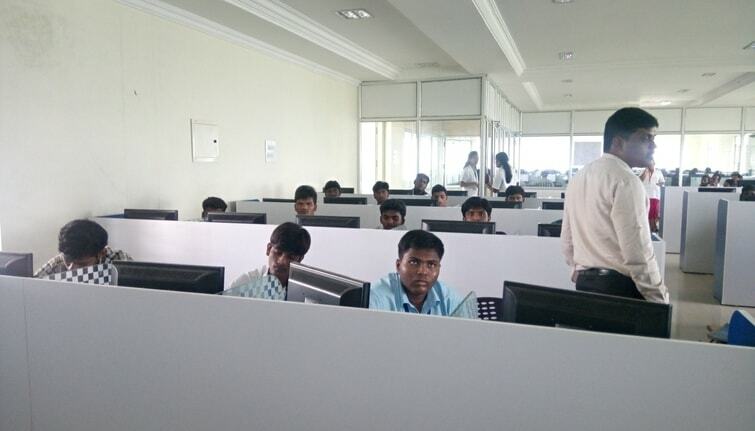 The reason students select Computer Science and Engineering is not only because of the physical infrastructure, which is all there; but because of the soft factors like our approach to academics, our intellectual property, value-added courses like .Net, Java, Red Hat Linux, training and placement. The quality of academic instructions, conduct guidelines and college activities are designed to produce competent and successful engineers. In the Department the focus is on preparing professional engineers. As they say an engineer is for today, while a professional engineer is forever. Currently, the Department of Computer Science and Engineering at Tagore Institute of Engineering and Technology offers Bachelors Degree in Computer Science and Engineering which imparts knowledge in areas like computer software, Operating Systems, Networking, Security, Embedded systems, Database management systems, etc. The department has four well equipped laboratories. The laboratories are equipped with latest computer hardware and licensed software. In order to equip the students and the faculty members with the latest in the field, the department regularly organizes Faculty Development Programmes (FDP), Workshops and seminars. In the recent past the department had conducted programmes on Cyber security, Ethical Hacking and Image processing. The department has four Computer Laboratories, all of which are, well equipped, including a dedicated facility mainly for the student projects. Programming laboratory includes facility to learn languages like C, C++, JAVA and C# . Our Data Structures laboratory is well equipped and students get trained in implementing various data structures using C++ and Java. About 200 books in various areas of computer science are available in our department library for the use of staff as well as the students. The department tries to create an intellectually stimulating learning environment and encourages mentoring of the students by its competent faculty members. Several of its faculty members have rich industrial experience and this helps the students get the right balance of theory and practice. The students are encouraged to participate in co-curricular and extracurricular activities. Many of our students have secured prizes in various competition at inter collegiate level in paper presentation contests, coding contests, best manager contests and several other arts competitions. Students implement CPU utilization algorithm, programming memory allocation & de-allocation, screen saver, system calls & interrupt handling. The Database operations like database design creation at structure log file and control file, DML and DCL commands are performed using Oracle. Application program using overloading, inheritance & templates concept are implemented. Students perform the image & pixel level execution and implement different algorithms for handling the graphics application. Application program using Multithreading, Java applets and JDBC concepts are implemented. Rational Rose, IBM small case, Software Engineering tools are used for testing & for other software development life cycle concept. All the advance experiments based on the Internet application, server side implementation with the help of web server and Data Base server are performed. The complete concept of compiler design and its implementation using different tools like Lex, Yacc etc. are done. TCP, SMTP, FTP, DATAGRAM & all network congestion control algorithms are implemented. Students implement PHP with Database connectivity, PYTHON programming, Perl script and CGI, install MySQL, Apache & Network simulator (NS2) installation and simple tcl scripts concept. Simple problems are solved using CASE tools. Designing and testing of an application is done by two ways i) Structure analysis and design method and ii) Object oriented analysis and design method. One/two pass assembler, absolute loader, relocating loader, linker and a simple text editor with features like insertion / deletion of a character, word, and sentence are implemented. Fundamentals of programming concept like data types, Conditional & Control statement, Array, Structure and Union are explained elaborately. Project lab is having very good computing power with latest H/W & S/W like ORACLE 10G, J2EE1.5,MATLAB 7.0,Visual Studio 2008, JWS etc. 03rd – January – 2018. The Institute of Engineers (India), Salem Local Centre under the Aegis of Computer ENGINEERING DIVISION BOARD (CPDB) organized an One Day Seminar Titled “R PROGRAMMING WITH BIG DATA ANALYTICS” in association with The Department of Computer Science and Engineering of Tagore Institute of Engineering & Technology with the approval from IE(I) Headquarters , Kolkata held on 03/01/2018 – Wednesday at TIET Premises. The Main aim of the Seminar is to provide a wide knowledge to the engineering Graduates about the R programming with Big Data Analytics. 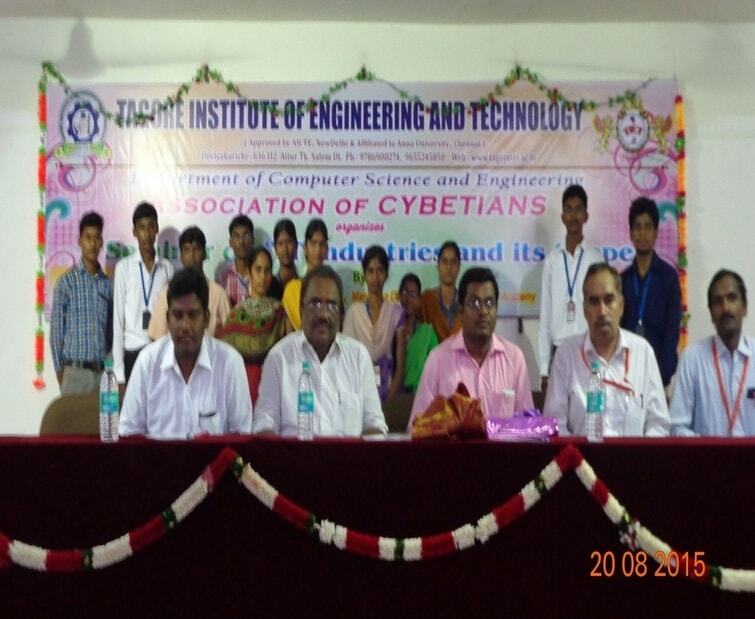 The Association Inauguration was done by the Association of CYBETIANS on 17th September 2011. The Chief Guest Mr. Naveen kumar, System Analyst, Tech Mahindra, Bangalore attended the function. Principal Dr. P. Prakasam, Convenor Mrs. B.Sundarambal, HOD/CSE and Coordinators Mr. R.Rajasekar and Mr.S. Sudhakar AP/CSE was inaugurated the association. The Association of CYBETIANS organized the National Level Technical Symposium on 2nd March2012 (Friday). The Chief Guest was Mr. Srinivasa Desinghan, Director, HP - Bangalore presided over the function. Dr. P. Prakasam, Convenor Prof. B.SundrambalASP&HOD/CSE, Coordinators Mr. R.Rajasekar and Mr.S. Sudhakar AP/CSE attended the function. The Association Inauguration was done by the Association of CYBETIANS on 4th August 2012(Saturday). In this regards, we invite the Chief Guest Mr. Sundararajan Ramanathan, Immigration Domain-Manager, Wipro, Bangalore. The Principal Dr. P. Prakasam, Convenor Prof. R. Rajasekar, ASP&HOD/CSE, Coordinator Prof.S. Sudhakar AP/CSE presided over the function. The Association of CYBETIANS organized the Intra Department meet on 8th March 2013. 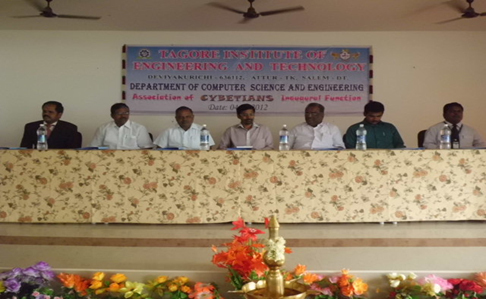 Mr. Vasantha Kumar, Director-TIET, Principal Dr. P.Prakasam, Mr. R.Rajasekar, HOD/CSE and Mr.S.Sudhakar, Association Coordinator presided over the function. Organized the Association Inauguration by the Association of CYBETIANS, which is to be held on 2nd August 2013(Friday). In this regards, we invite the Chief Guest Mr. Caldwell Velnambi, Founder, CEO at ERP Logic, Inc. So. Patron Dr. P. Prakasam, Convenor Prof. R. Rajasekar ASP&HOD/CSE, Coordinator Prof.S. Sudhakar AP/CSE. Organized the Technical Workshop for NS2 (Network Simulator-2) by the Association of CYBETIANS on 3rd&4th October 2013. 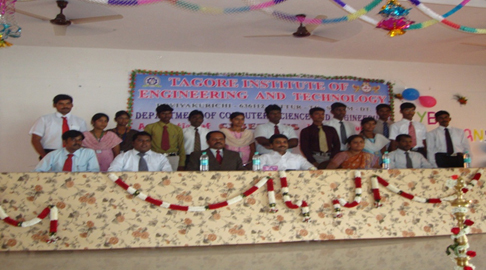 In this regard, the Chief Guest Dr. A. B. Chandramohan, Professor and Director, Department of IT, Jaya Engineering College, Tiruninravur, Chennai-602024. Principal Dr. P. Prakasan, Convenor Prof. R. Rajasekar HOD/CSE and Coordinator Prof.S. Sudhakar AP/CSE attended the function. 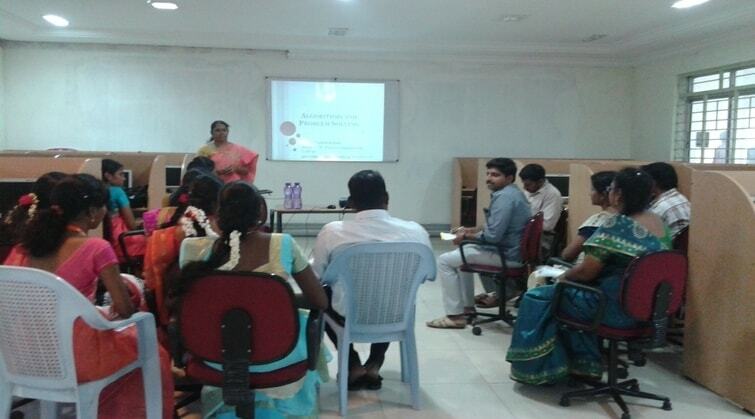 Organized the Technical Workshop for Cloud Computing by the Association of CYBETIANS, on 3rd September 2014. The Chief Guest Mr.Monikandan, Dean & Professor, Christhuraj College of Computer Applications, Trichy, Principal Dr. A. Sivasubramaniyan, Convenor Prof. R. Rajasekar ASP&HOD/CSE, Coordinator Prof. K.Raja AP/CSE was attended the function. 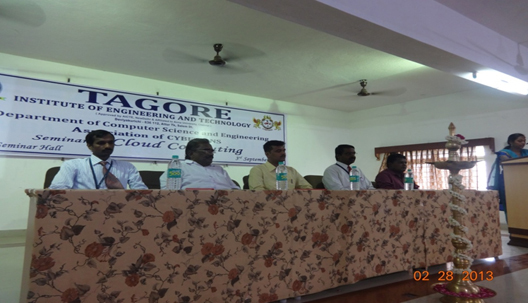 The Department of Computer Science & Engineering of Tagore Institute of Engineering and Technology, Deviyarkurichi, near Attur conducted a Seminar on “IT INDUSTRIES AND ITS SCOPE” on 21.09.15. 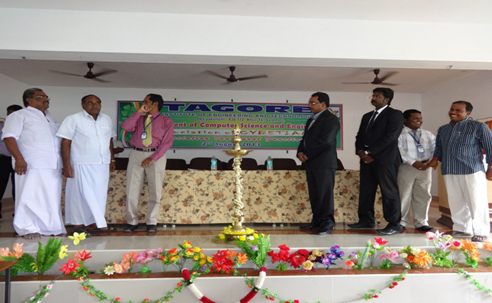 Mr Karthick Swaminathan, S2I Vector Animation, Erode was the chief guest. 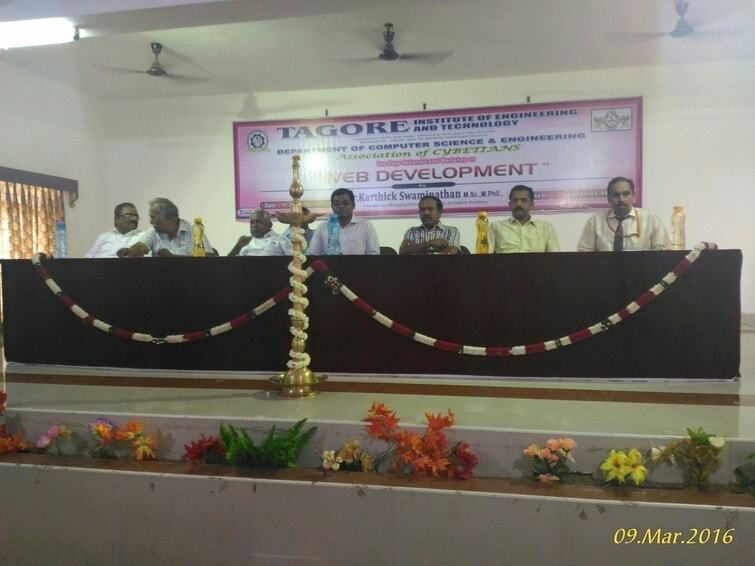 The Department of Computer Science & Engineering of Tagore Institute of Engineering and Technology, Deviyarkurichi, near Attur conducted a National Level Technical Workshop on 9.03.2016 to 10.03.16. 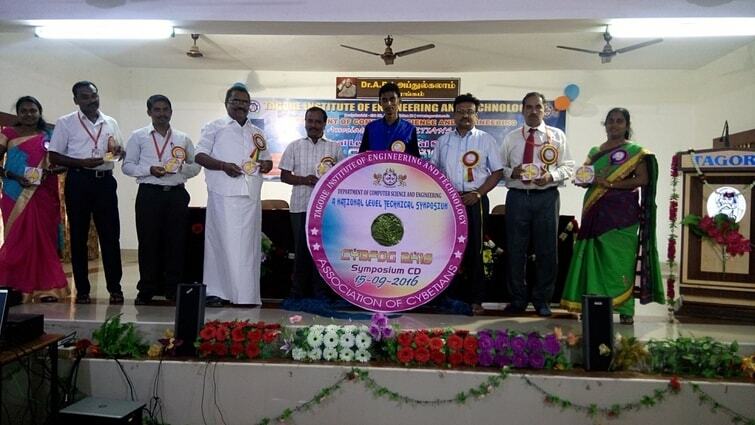 Mr Karthick Swaminathan, S2I Vector Animation,Erode, who was the chief guest. The Department of CSE, ECE and EEE were conducted Association inaugural function on 19.08.16. The president Mr.R.Lakshminarayanan, vice president Mr.R.Chinnusamy, the secretary Mr.K.Arunkumar, joint secretary Mr.R.Muthusamy,treasurer Mr.Kaliyanan,the educational committee members Mr.R.Paramasivam, Mr.Kootroad .N.R.Palanivel were presided over the function. The Principal Dr.S.Senthilkumar delivered excellent speech on Future implementation of advanced technologies in circuit branches. The Head of the department Dr.R.Vasanthi introduced student office bearers in the academic year. The HODs from various department, Professors, Assistant professor, Lab technicians and students were participated in this event. The department of CSE conducted Workshop on “LaTeX” in 01.09.2016. The Resource person Mr.Jagadheesan , delivered workshop in this topic. The faculty members, Lab Technicians and students were attended this event. The Department of CSE conducted National level technical symposium function on 15.09.16. The president Mr.R.Lakshminarayanan, vice president Mr.R.Chinnusamy, the secretary Mr.K.Arunkumar, joint secretary Mr.R.Muthusamy,treasurer Mr.Kaliyanan,the educational committee members Mr.R.Paramasivam, Mr.Kootroad .N.R.Palanivel were presided over the function. The Principal Dr.S.Senthilkumar delivered excellent speech on Future implementation of advanced technologies in circuit branches. The chief guest Dr.S.MohideenBhadusha, Professor in CSE,KSR College of Engineering, Tiruchengode delivered his views on “Role of Engineers to upcoming Technology”. The Head of the department Dr.R.Vasanthi delivered welcome address. The HODs from various department, Professors, Assistant professor, Lab technicians and students were participated in this event. Department of CSE conducted FDTP on “CS6402 –DESIGN AND ANALYSIS OF ALGORITHMS” from 05.12.2016 to 15.12.2016. The Resource person Dr.A.Suphalakshmi Professor/CSE, Paavai Engineering College, Namakkal delivered seminar in “Notion of algorithm & problem solving”. The faculty members from various institutions and PG students were attended this event. R.Rajasekar and M.V.Saranya, "Analysing the Big Data Characteristics using ABE Technique" International Journal of Innovations in Scientific and Engineering Research(IJISER), Vol 1, Issue 10 Nov 2014. R.Rajasekar and P.Prakasam, "Performance Analysis of Mobile sampling and Broadcast Scheduling in wireless sensor networks " Proc. of IEEE International Conference on Current Trends in Engineering and Technology (ICCTET'13), pp. 488-493, August 2013. Praveena.R and Rajasekar.R and Prakasam.P "Performance analysis on distributed coordinated mobile sensor control target tracking in multiple wireless sensor networks", proceedings of international conference on advanced computing, machines and embedded technology (ICACT 2014) at J.K.K.Nattraja college of engineering and technology held on 7th& 8th march 2014. PP.548-554. T.Aarthi, R.Rajasekar and P.Prakasam, " A survey on data aggregation in wireless sensor networks" IEEE International Conference on "Knowledge Collaboration in Engineering" at Kathir College of Engineering, Coimbatore, paper id: 368, January 2014. Sasikala.M, and R.Rajasekar "A Novel Beaconing Strategy for Geographic Routing in Mobile Ad-Hoc Networks," Presented paper in National Conference on Emerging Trends in Information Technology at Nehru Institute of Information Technology and Management Coimbatore, (NCETIT13), PP 109-114, Oct 2013. Praveena.R, and R.Rajasekar "Distributed Coordinated Mobile Sensor Control Target Tracking in Multiple Wireless Sensor Networks," Presented paper in National Conference on Emerging Trends in Information Technology at Nehru Institute of Information Technology and Management Coimbatore, (NCETIT13), PP 103-108, Oct 2013. Narendran.M and Dr.P.Prakasam Presented paper in International Conference on Knowledge Collaboration in Engineering by Kathir College of Engineering. Coimbatore, 24th and 25th January 2014. 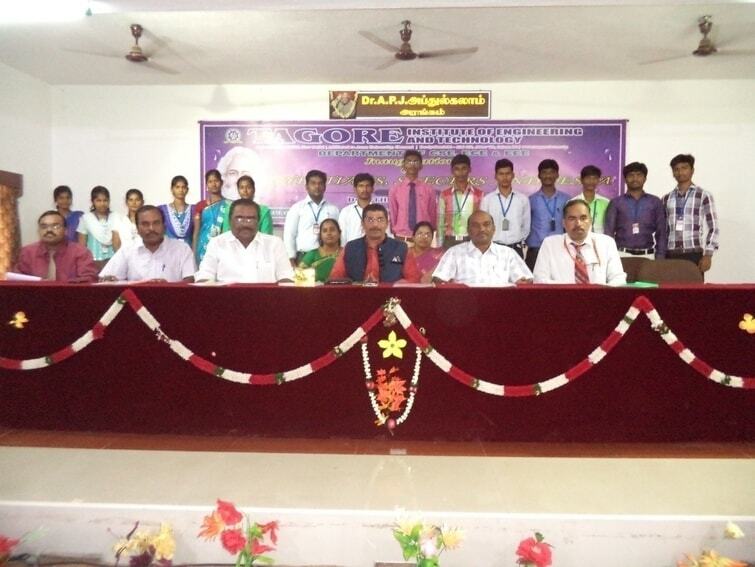 Narendran.M and Dr.P.Prakasam Presented paper in International Conference on Adaptive Technologies for Sustainable Growth at Paavai Engineering College, Namakkal, May 2014. Narendran.M and Dr.P.Prakasam Presented paper in International Conference on Current Trends in Engineering and Technology at Askya College of engineering and technology, Coimbatore. July 2014. Narendran.M, Dr.P.Prakasam and Kayalvizhi.N published "Sink node redeployment technique for upgrading Network Lifespan in Wireless sensor networks" in American International Journal of Research in Science, Technology, Engineering & Mathematics (AIJRSTEM), pp.12-16, Volume 1, Issue 8, Sep -Nov 2014. Narendran.M and Dr.P.Prakasam published "Mobility Based Energy Utilization In Wireless Sensor Network" in International Journal of Emerging Technologies in Computational and Applied Sciences (IJETCAS), pp.198-203, Volume 2, Issue 10, Sep -Nov 2014. Narendran.M and Dr.P.Prakasam published "Energy Efficient Control Sensor Node Deployment with MobiSink: A Review" in International Journal of Applied Environmental Sciences, pp. 2777-2791, Volume 9, Number 5, (2014). Narendran.M and Dr.P.Prakasam published "A Review on Cluster Based Data Collection in Wireless Sensor Networks" in International Journal of Applied Engineering Research, pp. 19259-19277, Volume 9, Number 23, (2014). International Journal of Innovative Research in Technology & Science(IJIRTS)(Impact factor-2.236 ) A Survey on the Scope of Cardiac Arrhythmia Classification using BCG Vol.2, No.36, Nov 2014.
International Journal of Computer Science and Engineering Communication (Impact factor-2.5 ) Privacy and secure rescindable information access management in Multi-Authority Cloud Vol.3,Issue 2,2015, pp.862-865, ISSN:2347-8586.
International journal of Computer Science and Engineering Communications(Impact factor- 2.5)(h-index=1) Security Model for Healthcare Application in Cloud Computing Vol.3,Issuse 2,2015, pp.627-635, ISSN:2347-8586.
International journal of Computer Science and Engineering Communications(Impact factor-2.5 ) Statistical Traffic Analysis for Routing Protocol on MANET’s Vol.3,Issuse 2,2015, pp.691-694, ISSN:2347-8586.
International Journal of Contemporary Research in Computer Science and Technology(Impact factor-0.565) Revocable Data Access Control in Multi-Authority Cloud Vol. 2, No. 1,January 2016, pp.385-387, e-ISSN: 2395-5325. Journal of medical imaging and health informatics(Impact factor -0.877) An improved medical inference knowledge system using entailment rules Vol.6, 1-5 , 2016. ISSN 2156- 7018. R.C.Karpagalakshmi International Journal of Advanced Research in Computer science(Impact factor -5.42) Hierarchical Clustering of Music towards Human Mood Volume 1, NO.4, Nov-Dec 2010.ISSN:0976-5697 pp.93-96. International Journal of Advanced Research in Computer science and Software Engineering(impact factor-2.5) A Survey on Search-As-You-Type Using Ranking Queries Volume 3, Issue 10, Oct-2013, ISSN:2277-128X pp.1040-1043. Journal of Theoretical and Applied Information Technology(impact factor -0.26) Surveillance of vehicle objects with aerial Images using localization and posture based Local gradient model 10th June 2014. Vol. 64 No.1, ISSN: 1992-8645, pp- 199 – 204.
International Journal of Engineering and Technology(impact factor - 0.8470) Event Detection at Vehicle Location Points using Spatial Time Invariant Model Vol 6 No 2 Apr-May 2014, ISSN : 0975-4024, pp – 1188 – 1193.
International Journal of Applied Engineering Research, (impact factor -0.16) Orientation Model for Effective Event Detection in Vehicle Location ISSN 0973-4562 Volume 9, Number 23 (2014) pp. 18889-18898. The International Daily journal Evaluating the Learning Objects in Domain Module generation from Plain text book ISSN 2278 – 5469 EISSN 2278 – 5450, Discovery, 2015, 32(142),22-27. EJERM(impact factor =0.654) Automated formation of domain module from plain textbooks Using dom-sortze system P-ISSN: 2347-4408 E-ISSN: 2347-4734 ,April 2015, Volume - 2, Issue – 2. The International Daily journal Sketch and execution of productive virtue security for android smart phone ISSN 2278 – 5469 EISSN 2278 – 5450, Discovery,2015, 30(122), 116-121. K.Balasubramani International Journal of Advanced ResearchTrends in Engineering and Technology(IJARTET)(impact factor – 4.753) Privacy on Encrypted Cloud Data Multi-Keyword Ranked Search ISSN 2394-3777(Print) and – ISSN 2394-3785(Online), Volume 3, Special issue 2, March 2016. E.Shapna Rani International Journal Of Engineering And Computer Science (IJECS) (impact factor – 0.342) Multi-Input Multi-Output Network Systems in DERS using Self-Tuning Proportional Integrative plus Derivative (SPID) Controller ISSN: 2319-7242 Volume 2 Issue 7 (July 2013), Page No. 2167-2176.
International Journal of Engineering Research and Technology(impact factor- 2.70) An Intrusion Detection System for Multitier Web Applications Using Double Guard ISSN: 2319-7242 Volume 2 Issue 7 (July 2013), Page No. 2162-2166. A.Surya International Journal of Innovative Research in Computer and Communication Engineering (IJIRCCE)(impact factor- 6.577) Recommendation of Desired Learning Path to Provide Optimized Concept Access 17th May 2013. Volume 1- Issue 06.
journal DISCOVERY Efficient Tripper Query Answering Approach By Using Optimal Pruning Methods inRoad Networks Volume 30, Number 120, Pages 87-93, April 2015. SSRG-IJCSE-NCRACCESS(impact factor- 0.910) Tripper Application: Optimal Pruning Method via the Collection of Real Time Traffic Data in Road Networks 2015. U.Valampuri International journal of innovative research in computer and communication engineering (Impact factor -6.577) Privacy preserving and private frequent itemset Mining via smart splitting Vol 3, No.10, ISSN NO.78979 -998, Oct 2015..
R.Kanimozhi International Journal of emerging technology and advanced Engineering(impact factor- 0.564) A Real Time Embedded System of vein used for Authentication in a Teller Machine ISSN-2250-2459,Vol 3 , Special issue 01 January 2013. C.Malliga The International Daily journal Evaluating the Learning Objects in Domain Module generation from Plain text book ISSN 2278 – 5469 EISSN 2278 – 5450, Discovery, 2015, 32(142),22-27. EJERM (impact factor =0.654) Automated formation of domain module from plain textbooks Using dom-sortze system P-ISSN: 2347-4408 E-ISSN: 2347-4734 ,April 2015, Volume - 2, Issue – 2. R.Prasanna The International Daily journal Increasing jammer localization accuracy using global algorithm in wireless sensor network 2015, 30(121),100 – 108. H.Sheela International journal of Innovative Research in Computer and communication Engineering(Impact factor -6.577) Authorized deduplication check for confidentiality in a hybrid cloud Volume 3, Issue 11, No.2320 – 9801 , nov 2015. We have invested Rs 60 lakhs 35 thousands for CSE department lab equipments. CSE department inauguration conducted on 21st September 2015 & Organized Seminar on “IT Industries and its Scope”. Workshop on “WEB DEVELOPMENT”organized by CSE department on March 9th and 10th 2016. CSE faculties Mr K.Raja, Mrs P.Madhubala,Mrs R.C.Karpagalakshmi,Ms A.Surya, Mr P.Sasikumar,Ms U.Valampuri & Ms T.Aarthi produced 100% result in 2015-16 academic year. CSE faculties Mr K.Raja, Mrs P.Madhubala,Mrs M.Saranya, Mr K.Balasubramani, Mrs R.C.Karpagalakshmi, Mrs E.Shapnarani, Ms A.Surya ,Ms U.Valampuri,Ms T.Aarthi & Mrs S.Kokila presented papers in National and International conferences and attended seminars and workshop on various topics. Dept. of CSE arranged Industrial visit to RAC, Ooty and Air FM, Kodaikanal to enhance the student’s academic skills. Our M.E students T.Aanandhi, M.Nandhini, H.Sheela & M.Venkatesan has published papers in International Journals. Final Year students M.Logeswaran got 1st prize in Short Film organized by Adhiyaman Engineering College, Hosur. Our UG students S.S.Subashini and S.Kasthuri of Third CSE won 1st prize in “BEST OF WASTE” competition organized by M.Kumarasamy college of Engineering, Karur. R.Bharathi from Third Year student got 2nd prize in “Just a Minute” event organized by Adhiyaman Engineering College, Hosur. S.Elango of Third Year CSE got 1st prize in Quiz organized by Vivekanandha college of Engineering for women, Tiruchengodu. K.Karthik and R.Tamilselvan of Final CSE presented paper in National conference organized by Aadhitya Engineering College, Coimbatore. S.S.Subhasini, S,Kasthuri, A.Latha, S.Elango & R.Bharathi of Third CSE presented papers in various symposium and conferences. K.Karthik, R.Ragupathy, A.Amudha, P.Nithyamala, M.Priyanka, G.Preethi & M.Logeswaran of Final CSE has attended various National level workshops and symposiums. 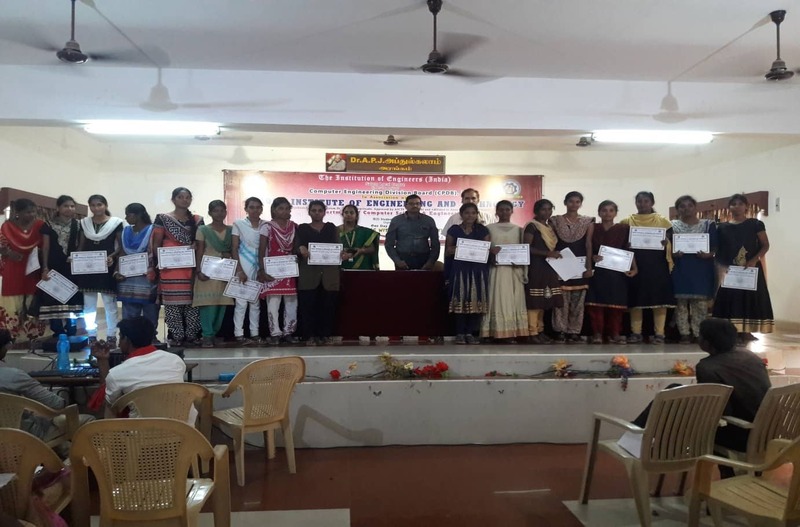 S.S.Subasini, S.Kasthuri, A.Latha, S.Kanimozhi, C.Elakiya, S.Elango, R.Gopi, R.Bharathi & P.Surya of Third CSE has attended various National level workshops and symposiums. Department of CSE has invested Rs 60 lakhs 35 thousands for CSE department lab equipments. The Department of CSE conducted Association inaugural function on 19.08.16. The Department of CSE conducted Workshop on “LaTeX” in 01.09.2016. The Department of CSE conducted National level technical symposium function on 15.09.16. Department of CSE conducted FDTP on “CS6402 –DESIGN AND ANALYSIS OF ALGORITHMS” from 05.12.2016 to 15.12.2016 approved by center for faculty development, Anna University, Chennai. Dr.R.Vasanthi And K.Raja Served as a Co-Ordinator for the Faculty Development Training Programme On “Cs6402 Design And Analysis Of Algorithm” FDTP approved by Anna university, Chennai during Dec 5 to 15 2016. Dr.R.Vasanthi, Mr.K.Raja, Mrs.P.Madhubala, Dr.R.C.Karpagalakshmi, Mrs.M.Saranya, Mr.K.Balasubramani, Mrs.E,Shapnarani and Ms.A.Surya has acted as Internal Resource person in FDTP approved by Anna university, Chennai during Dec 5 to 15 2016..
Mrs.R.Kanimozhi, Ms T.Aarthi, Mrs S.Kokila, Mrs C.Malliga And Mr.P.Sasikumar Has Participated In The Faculty Development Training Programme On “CS6402 Design And Analysis Of Algorithm” FDTP approved by Anna university, Chennai during Dec 5 to 15 2016..
Dr.R.C.Karpagalakshmi has completed her doctorial degree successfully on Dec, 2016 and published 6 papers in reputed international journals..
Dr.R.Vasanthi has given a guest lecture on “Big Data” for the students of Department of Computer Science and Applications on 06.01.2017 in Sri Kailash women’s College,Thalaivasal. Dr.R.Vasanthi has applied Seminar grant under AQIS Scheme of AICTE on Jan 11 2017. Dr.R.Vasanthi has presented paper in International Conference at Vivekananda College of Engineering for Women, Trichengode. Dr.R.Vasanthi Mr.K.Raja Mrs.P.Madhubala Mr.K.Balasubramani Mrs.M.Saranya Ms.A.Surya has published papers in reputed international journals. Mrs.P.Madhubala, Mrs.M.Saranya, Mrs.E.Shapna Rani, Ms.A.Surya has presented paper in International Conference at Paavai Engineering College, Namakkal. Ms.T.Aarthi and Ms.A.Surya has presented paper in National Conference at Arunai College of Engineering, Thiruvannamalai. Mrs E.Shapnarani And Mrs M.Saranya has attended The National Level Workshop On Web Application Development Using Python At Kongu Engineering College, Perundurai, Erode on 18.02.2017. Mrs S.Kokila, Mrs R.Kanimozhi, Ms T.Aarthi And Ms C.Malliga Has Participated In Csir Sponsored Two Days National Level Workshop On “Recent Internetworking Technologies In Distributed Systems” At Kongunadu College Of Engineering And Technology, Trichy on 10th and 11th feb 2017. Mr.P.Sasikumar And Mr.K.Balasubramani Has Participated In Hands On Training On “Network Security” Er.Perumal Manimekalai College Of Engineering on 20.08.2016. Dr.R.Vasanthi,Mrs M.Saranya, Mrs E Shapna Rani Mrs R.C.Karpagalakshmi And Ms A.Surya Has Participated In Faculty Development Programme Titled “R-Programming Tool” At Gnanamani College Of Technology on 06.08.2016. Mr.K.Raja Mrs.P.Madhubala Dr.R.C.Karpagalakshmi Mr.K.Balasubramani has attended workshop on “Introduction to Big Data Analytics organized by Gnanamani College of Technology, Namakkal. CSE faculties Dr.R.Vasanthi, Dr. R.C.Karpagalakshmi, Mrs.M.Saranya , Mr P.Sasikumar, Mrs.E.Shapnarani and Ms.C.Malliga produced 100% result in 2016-17 academic year. Department of CSE arranged Industrial visit to RAC (Radio Astronomy Center), Tea factory and TNEB, Ooty to enhance the student’s academic skills for 2 days from 22.07.2016 to 23.07.2016. Our M.E students Bawya,M Indhumathi N, Namratha K, Prabhu M and Sasikala N has published papers in various International Journals. S.S.Subashini , P.Surya And S.Kasthuri Participated And Presented The Paper Titled Graphical Authentication System For Allevating Shoulder Surfing With Pass Matrix In The Ncet-2017(National Conference On Emerging Technologies-2017) Held At Arunai College Of Engineering ,Tiruvannamalai on 11.3.2017. M.Nelson Manickam And B.Aunstraj Has Participated Paper Presentation Entitled “Wireless Technology” In National Level Technical Symposium Zesech’17 Organized By Idhaya Engineering College For Women, Chinnasalem on 04.03.2017. A.Kanimozhi, A.Dayana Mary, C.Ramya And P.Sathya, Has Attended The National Level Workshop On “Web Application Development Using Python” At Kongu Engineering College, Perundurai, Erode on 18.02.2017. B.Anustraj, D.Praveen Kumar, M.Nelsonmanickam, S.Sathish Kumar And P.Sasi Kumar Has Participated In Csir Sponsored Two Days National Level Workshop On “Recent Internetworking Technologies In Distributed Systems”, Organized By The Department Of Computer Science And Engineering Held On 10th&11th Feb 2017 At Kongunadu College Of Engineering And Technology,Trichy. S.S.SUBASHINI has participated in “RUBAY ON RAILS” Workshop conducted by College of Engineering Guindy, Anna University Chennai as a part of XCEED, the outreach programme of KURUKSHETRA 2017, held at Annapoorna Engineering College on 17 and 18 sept 2016. Our M.E students Bawya M, Indhumathi N, Namratha K, Prabhu M and Sasikala N has attended workshop on “Introduction to Big Data Analytics “organized by Gnanamani College of Technology, Namakkal. S.Kanimozhi and C.Ellakiya IV CSE has presented paper in International Conference at Paavai Engineering College, Namakkal on 17.03.2017. A.Latha, S.Kasthuri, S.S.Subashini and P.Surya IV CSE has presented paper in National Conference at Arunai College of Engineering, Thiruvannamalai on 11.03.2017. Bharathi.R Venkatesh S, S.Elango, R.Gopi and B.Balraj IV CSE has presented paper in National Conference at Narasus Sarathy Institute of Technology, Salem on 18.03.2017.